First, congratulations on taking action to improve your golf swing. You’ve proven that you are serious about hitting longer, straighter and more consistent golf shots and I am really looking forward to helping you do that! You see, most golfers with swing plane problems swing over the top. 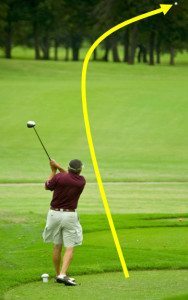 This causes weak, inconsistent golf shots. And the most common shots are big pulls to the left or the old disastarous left to right slice. While I do cover swinging over the top in the Easy Swing Plane system, I don’t go into detail of how to hit powerful, professional draws. Shots that start out to the right of your target and then draw back — just like the pro’s hit. “17 Days To A Professional Draw” is proven to help golfers just like you hit professional draws. It’s the perfect compliment to the Easy Swing Plane program. And because you’re now a VIP customer of Consistent Golf I’m going to offer you this program at a fraction of the normal cost. As you know, my name is Jeff Richmond. I’m the Director of Instruction for Consistent Golf, and I’ve put together a simple 17 Day, step-by-step plan which you can follow to help you…. Was it enjoyable to be about 20 yards past Bubba on 16 today? You’ll achieve all of this because…. You’ll save time, money and the frustration of trying to put other pieces of information together into a detailed plan because…it’s already done for you and guaranteed to work! Attention Left Handers! All of the daily instructions AND pictures have been converted, just for you! No more trying to convert right handed instructions to left handed. That’s tough, confusing and slows down your improvement progress. I’ve done all the conversion for you so you can make improvements fast, so you hit the ball better, quicker than you ever thought possible. You get 3 tried and tested drills that will almost force you to…take the club away correctly, so that your golf swing gets off to the start needed to fix your slice. You’ll be amazed at how quickly your shots start going straighter and longer as a result of doing these simple drills. Plus, you get instant feedback with these drills, so you know whether you’re doing them correctly. Plus…you can do all of the 3 drills in the comfort of your home. Yes! You can hit consistent, powerful and professional draws for just $24.97. But be warned — this is a one off price. If you leave this page without ordering right now, you’ll never get this special price again. It’s strictly a one time offer. Hit Professional, Consistent Draws For Just $24.97! No thanks. I will pass on getting the 17 Day’s To A Professional Draw system and saving myself $22.03. I will just get the Easy Swing Plane program that I have ordered. I know that I will never get this discounted price on the Draw System ever again and I’m OK with that.